After successfully completing more than 100 days as trailer Vishwaroopam finally hit theatres in Tamil Nadu, notwithstanding the exorbitant hype and hoopla over its release. A major conspiracy by a Taliban Muslim outfit to wreck havoc in America is averted by an Indian RAW officer is the plot. It could have been a racy movie had Ulaganayagan Kamal Haasan worked on a clearer and tighter screenplay. In spite of a perfect star casting and excellent choice of location -- a slow start and an abrupt end prove a dampener. That the story meanders from present to past often confuses the viewers. The story starts as Kamal’s Brahmin wife is attracted towards her boss and appoints a man to spy her husband, a Kathak dancer, to find out whether he has any “connection” with another girl. The obvious reason is to find an excuse to marry her boss. (Kamal safely uses Brahmin language to avoid backlash from other quarters). The spy who follows Kamal gets killed and Kamal and his wife get abdicated by a Muslim outfit. 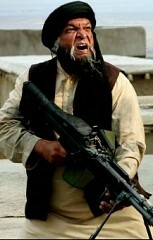 When, Kamal’s picture is sent to Omar, the head of the outfit, his first Vishwaroopam starts. The first 45 minutes of the movie is a reminiscence of his previous movie Manmadan Ambu and Superstar Starrer Basha. Kamal’s performance as a Kathak dancer, as a member of a Muslim outfit and as a RAW officer is excellent. However he should have taken more care to hide his age with make-up, especially in shots where he is shown in close-up with his young wife. The movie fails to sustain the thrill as the audience is clear about his agenda throughout. The picturisation of the crowd uttering in unison, “Allahu Akbar” after the execution of a Muslim is in bad taste. There are fraudulent Godmen in every religion. The repeated appearance of Muslim characters frame after frame even though the story warrants it, is jarring. Vishwaroopam takes it for granted that the viewers have proficiency in Tamil, English and Urdu. We were thinking it was a Tamil movie! The background music is partially good. Till all the theatres equipped with latest sound technology, the experiment in sound engineering will not fetch the desired results. Why Shruti Haasan doesn’t want to get married? 3 nights of Kamal Haasan starting this week ! This page has information about Vishwaroopam Movie Review (After Those Seven Cuts), Kamal Haasan, Vishwaroopam.